Chief Ranger Bill Reid will be leading a hike on the Nipmuck Trail as part of CT Trails Day, June 2. 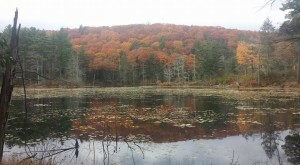 The hike will be a five-mile loop through a remote section of the blue-blazed Nipmuck Trail in Yale Forest. There are some steep sections and two beautiful overlooks. We’ll also be joined by the daughter of the man that created/blazed this section of the trail. This hike is limited to 20 people with limited parking at the trail head on Barlow Mill Road. The Nipmuck Trail Hike will be held 9 a.m. to noon, June 2, Barlow Mill Road and Boston Hollow Road in Eastford, CT. Please RSVP to Bill Reid to sign up and for further information and instructions. Rain cancels. 860-774-3300 or bill@tlgv.org.